There has been an emerging trend of ordinarily worshipful Fox News shills mustering up the gumption to be mildly critical of Donald Trump. This may be because the boorish behavior, jaw-dropping ignorance, and off-putting narcissism of Trump might finally be starting to produce the same sense of nausea in these otherwise devoted cult followers that the majority Americans feel. Or maybe they just see the writing on the impending indictments from special counsel Robert Mueller. It’s good to know that Carlson can’t stand Trump’s “self-aggrandizement and boasting” (as demonstrated this week following the Bush funeral). But it would more helpful if he said it on his primetime Fox News program than in a Swiss magazine that his viewers have never heard of and would never read. It’s also nice to see that Carlson recognizes that Trump is an idiot who can’t learn. So he might want to let his viewers know that. Of course, the reasons for Carlson’s disappointment are that Trump hasn’t successfully implemented the campaign of right-wing bigotry and suppression of the poor that Carlson is hungering for. 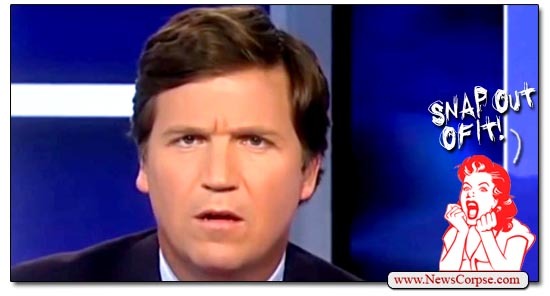 What Carlson really wants is a more competent leader to clamp down on the people that he doesn’t like who are ruining America for his elite class mates. The one saving grace of Trump’s presidency is that he’s too stupid to get much done. And that’s what’s irking Carlson. It will be interesting to see if Trump responds to this display of disloyalty with an anti-Tucker tweetstorm. After all, Trump has been generous with his accolades for Carlson. He even tweeted a promotion for Carlson’s book (along with 30+ promotions for other rightist authors). However, it will be difficult for Carlson to defend himself, at least on Twitter. A month ago Fox News began a self-imposed boycott of Twitter to protest the social media platform’s failure to punish some lefty activists who went after Carlson. But even after the offenders were booted off the site, Fox still hasn’t posted a tweet since then. And neither has Carlson. Resulting in a Twitterverse that is just a little bit more pleasant for everyone else.